The new AquaTRAM® 90 is anchored directly into the deck with the popular Quickset Dial Wedge™ Anchor socket, making it removable without tools. 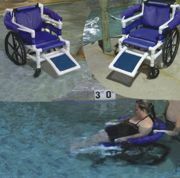 The AquaTRAM 90 will lower the swimmer directly into the water and when done swimming, will then raise up and turn 90 degrees for them to exit the chair. The unit offers dual flip-up armrests that provide easy and safe access, a comfortable seat with adjustable lap belt and footrest, plus simple-to-operate controls that provide easy access in and out of the pool. Everyone exercises, everyone gets thirsty, and everyone wants to make a positive impact on the environment by reusing their own bottles. The Model 10150 SM Accessible Bottle Filler and Drinking Fountain meets ADA for both the bottle filler and the High and Low requirements for drinking fountains. It also features a water filter. Choose from other options and 16 standard colors to customize this product to your location. The Aquatrek River Runner is capable of floating up to 300 pounds with the current of the leisure river. At three-foot depth, the chair will begin to float with the current and is more stable than an inner tube. In deeper waters, it reclines back for a comfortable ride. The transition from pool lift to River Runner is safer and easier to manage than trying to wrestle with an inner tube. Enjoy the ride! The Multi-Gym is a four-station fitness unit designed to provide wheelchair-bound individuals with exercise. Its use can be enhanced with the Swivel Seat accessory, which allows able-bodied people to use this equipment. 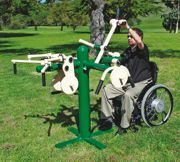 The four equipment stations include: Shoulder Wheel, a free-spinning wheel primarily used for flexibility; Hand Bike & Foot Bike, free-spinning handles and pedals used for coordination and cardio; Rotator, slight resistance used for flexibility and strength; and Shoulder Press, primarily used for overhead strength. The PAL2 is the latest innovation from S.R. Smith, the leading provider of ADA-compliant pool lifts. It is a fixed portable lift that boasts an elegant, sleek design. The PAL2 provides the benefit of portability, yet with the exclusive Secure it Kit can be fixed to the deck. All S.R. Smith lifts are third-party tested and verified ADA compliant. GT Grandstands Elevated Bleacher Series and Grandstands both offer seating solutions that exceed ADA accessibility requirements. The Elevated Bleacher Series offers ADA-compliant seating solutions with its wheelchair-accessible section. Grandstands offer ADA-compliant seating options that are incorporated into the design. Grandstands offer an easy access ramp to ensure people of all abilities can enjoy the game with open lines of sight. If you are looking to preserve deck space while maintaining a clear, sleek look to your pool area, Spectrum Aquatics' ADA-compliant Portable Freedom Lift is the answer. The Portable Freedom is a movable, battery-powered lift with a small footprint, and can be wheeled away and stored until needed. It features a 300-pound lifting capacity and six points of contact on the deck for maximum stability. The i-Lift™ is the only lift that offers a wireless remote control as a standard feature. The unit is battery-operated, with a low battery warning light and manual override switch, and delivers up to 90 lifts at a maximum capacity on a single battery charge. Easy to install, the i-Lift can be removed without tools when not in use. The i-Lift has a 300-pound weight limit, and 360-degree continuous rotation to allow loading from any position.